The IBM 4039 LaserPrinter features the ability to add duplex capability, and broader connectivity than the 4029 series of IBM LaserPrinters. A PostScript** Level 1 interpreter with 39 Type 1 outline fonts, PCL5, and true 600 x 600 dots per inch (DPI) meet user needs for broader functions as standard features on a compact desktop LaserPrinter. The 4039 LaserPrinter is designed, through integrated network adapter options, for attachment to Token-Ring and Ethernet local area networks, and networks with the Appletalk** Network Interface. In addition, direct attachment, via parallel or serial, can be made to IBM Personal Computers, RISC System/6000*, and Apple Workstations. The 4039 does not support PPDS. The Lexmark** 4039 10plus printer is a versatile network/desktop laser printer by Lexmark for attachment to Personal Computers, and PC compatible products, RS/6000 systems, and attachment to Local Area Networks via its INA slot. The Lexmark 4039plus printer is marketed with the Lexmark logo as a Lexmark product. The Lexmark 4039 10plus has all the functions provided by the current IBM LaserPrinter 4039 plus series, with new advances. The Lexmark 10plus printer can run at 10PPM in 600 dpi mode. The 4039 10plus can handle many different types of media such as labels and card stock. The 10plus set-up and driver utilities provide standard datastreams of PostScript** Level 2 and enhanced PCL 5 emulations. Versatile bi-directional communications and network management software of MarkVision** allows the customer to set up, monitor, and program the 4039 10plus printer without leaving the workstation. Description: The 4039 10plus provides customers with an affordable solution for printing professional looking text and graphics using the industry standard PostScript** Level 2 emulation and enhanced PCL5 emulation. The new printer drivers and versatile DOS Printer Toolkit allow downloading fonts, PCL macros or PostScript programs to flash memory. With new optional 4MB flash memory and 40MB hard disk the user may store more resources in the printer. User Productivity: The Lexmark 4039 10plus is designed for easy setup. The printer comes pre-assembled with print cartridge and paper tray already installed. A complete startup kit contains instruction manuals and the information necessary to be up and running quickly. A Printer Setup Utility and drivers for several popular software applications are included. A 4 x 20 LCD operator panel display uses terminology that leads the user through the available menus. The flash memory and disk options allow the user to download fonts that remain in the printer as long as the options are installed. Investment Protection: The 4039 10plus provides a solution for users that can use PostScript and PCL printing with the flexibility of upgradable code and network connectivity. Model Description 4039-10P:Available are: 4MB Flash Memory, 40MB hard drive options. Toner Saver and Draft modes are standard. The printers are at maximum height when equipped with the optional 500-Sheet Second Drawer. The printers are at maximum depth when both the front exit tray (or duplex option) and the optional Envelope+ Feeder are installed. Add 6 lbs if the duplex option is installed. Memory Options:Standard Printer Memory: 2MB. 2MB, 4MB, 8MB options (expandable to 10MB maximum). Since there are only two slots available for memory, only two memory cards can be installed at one time. Flash Memory Options: 1MB, 2MB, and 4MB options (for storing fonts and macros). Disk Option: 40MB (also for storing fonts and macros). Interface: Parallel interface with standard Centronics and RS-232/RS-422 Serial Adapter (optional). Maximum Usage: Up to 25,000 pages/month. Note: Paper trays are adjustable for executive, B5, letter, and A4 size paper. Note: Recycled paper less than 80 g/sqm is not recommended for this printer. Due to the 4039 10plus print technology, paper designed for use with xerographic copiers may provide satisfactory print quality and feed reliability. Other types of supplies may be suitable. It is recommended that users test any particular brand for suitability to their applications. Refer to the printer User's Guide for additional media specifications. Additional memory is required for printing complex pages or full-page, high resolution images. Envelopes, card stock, and some labels may be fed through the manual feed. The manual feed tray and front exit bin should be used for heavy media that requires a straight paper path. When attached as an emulated device, full function of the printer is not supported. Functions such as page rotation, font selection, cpi, lpi, superscript/subscript, etc., may not be supported. Refer to the Connecting IBM Personal Printers to IBM Systems manual for attachment information. The Lexmark 4039 10plus printable area is limited to within 4.2 mm (0.167in) of the top and bottom edges and to within 6.25 mm (0.25-inches) of the left or right edges of the media. Any information placed outside this specified printable area will not print. For A4 paper, the information on the page is adjusted to fit 80 characters per line at 10 characters per inch. These cables should be used to ensure generally data integrity. Print Quality: During the life of the printer, components are subject to wear based upon usage. Printers continuously operating at or near the maximum duty cycle may require service for replacement of these components to ensure quality performance and printing throughout the life of the printer. PC Requirements: The 4039 10plus uses a parallel interface (commonly known as the Centronics type interface). The 4039 10plus will connect to some system units (such as IBM PC, AT, PS/2 or compatible) that support a Centronics/parallel interface. When attaching to a system unit, it is recommended that an IBM parallel cable (P/N 32F3176) be used to generally avoid compatibility issues. The 4039 10plus printer will connect to some system units (such as IBM PC, AT, PS/2 and compatibles) that support an RS-232 (or RS-422) serial interface, if a serial-to-parallel protocol converter is used. It is recommended that a Lexmark RS-232/RS-422 Serial Adapter (P/N 1363110) be used to avoid compatibility issues. It supports serial configurations of protocol, baud, and parity. IBM AS/400 System IBM Application System/400(R) with Operating System/400(R) Version 2 Release 2 or later. Note: Printer Serial Adapter P/N 1363110, F/C 3110, is required for serial attachment. Configure as an HP DeskJet 500 Printer with the printer in HP DeskJet 500 mode. Refer to the IBM manual "AS/400 Guide to Programming for Printing," SC41-8194, for additional information on using the Host Print Transform function. Configure with PFTHP2 and 5219 Emulation with the printer in HP DeskJet 500 mode. Configure with a compatible printer driver. 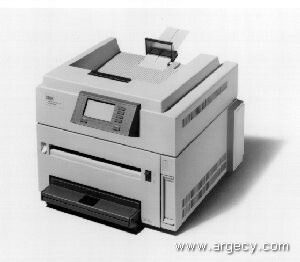 Configure as 4208 Mod 2 with 5219 emulation with the printer in IBM Proprinter X24E mode (serial attachment only). Configure with Multilingual 3 and 5219 emulation with the printer in IBM Proprinter X24E mode (parallel attachment only). Configure as an IBM 4207/4208 printer with the printer in IBM Proprinter X24E mode (parallel attachment only). Configure as an HP LaserJet II printer using supplied HPLASER2.PFT and 5219 Emulation with the printer in HP DeskJet 500 mode. IBM AIX Version 4.1.3. Printers can be supported on AIX Version 3 in emulation of previously supported printers. The 4039 10plus uses files generally provided by Lexmark to support the AIX operating system versions listed above. The AIX version 3 or higher printer files is packaged with the printer Installation Utilities for OS/2. These files are also available on the Lexmark Bulletin Board System. The software applications that operate with the HP** LaserJet** series 4 printer will generally operate with the Lexmark 4039 10plus in enhanced PCL 5 emulation. Utilizing IBM AS/400 DOS PC Support work station function and a supported PC or OS/2. Configure as an HP LaserJet IIID. Utilizing IBM enhanced 5250 emulation program Version 2.30 and a supported PC OR PS/2. Configure with the HP LaserJet 2.PFT and 5219 emulation. OS/2 2.0 External Services 1.0 may be configurated. Configure with the PFTHP2 and 5219 printer emulation. Configure with the HP LaserJet III and 3812 Emulation. Printer height is increased by 127mm (5 inches). Linking of the primary paper feed and this feature is supported via the front panel and datastream commands. Only one Second Drawer can be installed on the printer at a time. Extra Paper Trays(1) Optional paper trays provide customers with ability to have two different sizes or types of stationery available for the printer. The Duplex Option provides the capability to print and collate double-sided pages through the PostScript Level 2 and PCL5 data streams. The Duplex Option comes with a 14" special paper tray that allows duplexing from the standard paper tray location. Due to the design of this tray, input paper capacity is reduced to 130-sheets. 130-Sheet Duplex Paper Tray (Extra Tray) (#6191) Simplifies the process of changing from one type paper to another. Rather than removing the paper from the tray in use and replacing it with another type paper, a simple change of paper trays accomplishes the task. Flash Memory (#8586, 1MB), (#8585, 2MB), (#6461, 4MB) Flash memory provides the ability to store download fonts and macros, and change the contents as needed. Since there is only one slot available for these features, only one of the features can be installed at a time. Can only be utilized for storing PCL and PostScript resources. 40MB Disk Memory, (#5267) For storage of substantial amounts of data that must be kept resident on the printer. (PCL and PostScript resources only.) This feature is attached via the one open INA slot. 75 Envelope Feeder (#3151) Envelope Feeder is installed in the back of the machine, in place of the manual input tray. It allows the customer to automatically feed envelopes to be printed. Its capacity is approximately 75 envelopes of 75 g/sqm (20 lb) stock. With this feature installed, the height is increased by 61 mm (2.4 in) and depth by 147 mm (5.8 in). In relative humidity of 65% or higher, envelope flaps may seal. Manual input tray must be removed if Envelope Feeder is used. Only one Envelope+ Feeder can be installed on the printer. The Envelope+ Feeder and the Auxiliary Feeder are mutually exclusive of each other. 100-Sheet Auxiliary Feeder (#3966) The Auxiliary Feeder is installed in the back of the machine, in place of the manual input tray. It provides the customer an additional paper source to the standard tray or the second drawer. It is capable of feeding paper and transparencies. Its capacity is approximately 100 sheets of 75 g/sqm (20 lb) stock. With this feature installed, the height is increased by 61 mm (2.4 in) and depth by 147 mm (5.8 in). Manual input tray must be removed if Auxiliary feeder is used. Only one Auxiliary Feeder can be installed on the printer. The Auxiliary Feeder and the Envelope+ Feeder are mutually exclusive of each other. ** Windows is a trademark of Microsoft Corporation.